This is an example of a stab wound of the thorax. The knife passed through the first intercostal space on the left side and injured left internal mammary bundle. It further passed rim of segment III of the left upper lung wing and entered mediastinum, where it injured aortic arch. Left pleural cavity contains some blood in the dependend position. 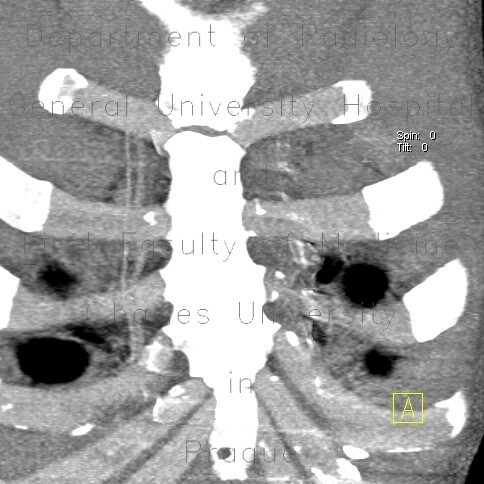 Mediastinum contains abundant blood which escaped from the aortic lumen - note pool of enhanced blood in the upper anterior mediastinum adjacent to the aortic arch.